About Batata Vada Recipe: A popular snack from the streets of Maharashtra. Batata translates into potato in English. Mashed masaledar potatoes coated in a thick besan (chickpea flour) batter and deep fried till golden. 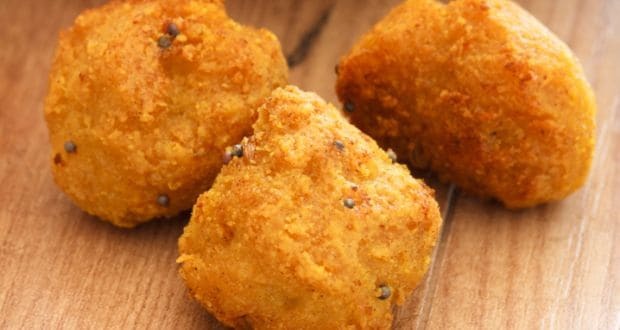 Served with a tangy chutney, batata vada is a street food delight tat you can easily prepare at home during the monsoon season or usually as an evening snack. These are simple and quick so you can easily dish up this chatpata snack when unexpected guests arrive. 1.Cook the potatoes until soft, peel and mash coarsely. 2.Chop or crush together the green chillies, garlic, ginger and the coriander leaves. 3.Using the mentioned ingredients make a thick batter. 4.Heat oil and add mustard seeds, after they crackle add the curry leaves. 5.Mix in all the rest of the tempering ingredients and add to the mashed potatoes. 6.Divide the potato mixture into equal sized portions, approximately the size of a lemon. 7.Dip each ball in the batter and deep fry until golden brown in color. 8.Serve hot with a chutney. love this snack.. feel like making this again! The only batata vada recipe you need.